I hate scraping my commercial kitchen’s flue. What should I do? Scraping a commercial kitchen flue is no one’s idea of a great time. 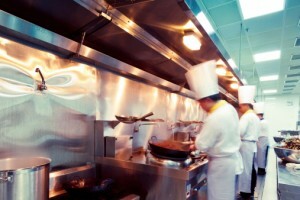 It takes so much elbow grease and needs to be done repeatedly to keep your commercial kitchen safe from flash fires. Hand scraping is a necessary though cumbersome and time-consuming tasks that many people would like to avoid. Good news! You can take flue cleaning permanently off your To Do list. What?! Hold the phone. How is that possible? Isn’t it really important for fire safety? Yes, consistently cleaning your commercial kitchen flue is essential. But that doesn’t mean that you have to do it. You don’t even need to pass off this annoying task to the new guy in the kitchen staff. Just begin a partnership with Flue Steam! You won’t have to worry about sweating over maintaining the cleanliness of your flue ever again. We offer complete hand scraping and steam cleaning services for your entire kitchen exhaust system, including the flue. Reduce your risk of fires and the costly disruptions they cause by signing up for regular kitchen exhaust system cleaning. Our cleaning services are thorough, fire-code-compliant, and highly reliable. Hand scraping – Many of our clients sign up for monthly hand scraping of their kitchen exhaust system. It’s a simple and affordable way to ensure your flue always stays clean. We clean the range hood, exhaust ducts, drip cups, and exhaust fans. We also offer to install code required access panels in your ducts to ensure your kitchen exhaust system cleaning service is absolutely impeccable. Steam cleaning – This service utilizes hot, high-pressure water to remove grease. It’s more expensive than hand scraping, but it’s also more thorough. Most clients like their kitchen exhaust systems to be steam cleaned 2-4 times per year. Certificates – Concerned about meeting your NFPA code obligations? You won’t need to be whenever you begin your partnership with Flue Steam. We provide “Certificate of Performance” stickers after each job as proof that your NFPA obligations have been fulfilled. You may even be able to secure a discount on your insurance bills when you partner with Flue Steam. And more! Making your commercial kitchen more safe is our #1 goal. That’s why every time we come to hand scrape and/or steam your kitchen exhaust system, we’ll also check your exhaust fan, belts, and other parts. We’ll grease your fan bearings too. If your belts are worn out and you have a replacement belt on hand, we’ll be happy to install that at no additional cost to you. With all the services provided by Flue Steam, our system will stay cleaner longer and be much safer for your kitchen staff and guests every day. If you’re interested in learning more about our services and possibly signing up for regular kitchen exhaust cleaning services, feel free to contact us today. We can be reached by phone at 800-700-FLUE and by email at contact@fluesteam.com. We look forward to making your life a little easier very soon. Scraping your commercial kitchen exhaust system can be such a drag – let us take care of the grunt work for you!